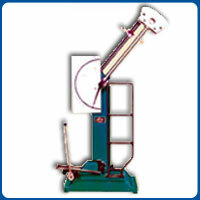 The pendulum Impact Tester Model IT 30 is designed for conducting izod, Charpy test. The test methods confirm to BS : 131 : part 4-1972 (amended 15 Aug. 1993) BSEN : 10045-2 : 1993 & ASTM : E-23-94a. There are two strikers and one combined support available for lifting in to the pendulum and on to the base of the machine for Izod., Charpy test, Changing from one striker to another is achieved simply by fixing the new striker into it's position. The charpy test piece rests on alloy support anvils, fitted on the base of the machine rigidly held in position by Allen screws. End stopper is provided for quickly and accurately locating the test piece centrally between the supports. The Izod test is clamped vertically in Izod support fitted on the base of the machine. The support is provided with a machined vertical groove to suit the test piece size. The front clamp piece and the Allen screw enable clamping of the test piece in correct height with the help of Izod setting gauge supplied. This impact tester offered with 300J energy exclusively for Charpy test confirming to ASTM- E-23. Impact Testing Machines is geometrically checked in the works to the more stringent requirements of the American standard. 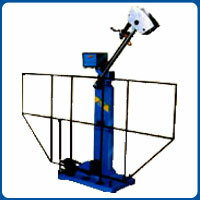 The accuracy of the machine is then verified by PROOF TEST by testing standard test specimens supplied the NIST, USA. All two sets of the five specimen must agree with the normal values within certain tolerance specified. Depth notch gauge including V & U notch gauges for checking depth blow V/U notch, angle and radius. Izod support for 0.450 dia Izod round specimen.